April 12-13 have a couple 10u openings, teams from NJ, DE, VA, CT, NY are registered. 12s and 14s are sold out. June 15-16 Futures event has 1 16 and 1 18u opening. July Classic has a couple openings at each age group. email Nightmarefp@gmail.com for more information. 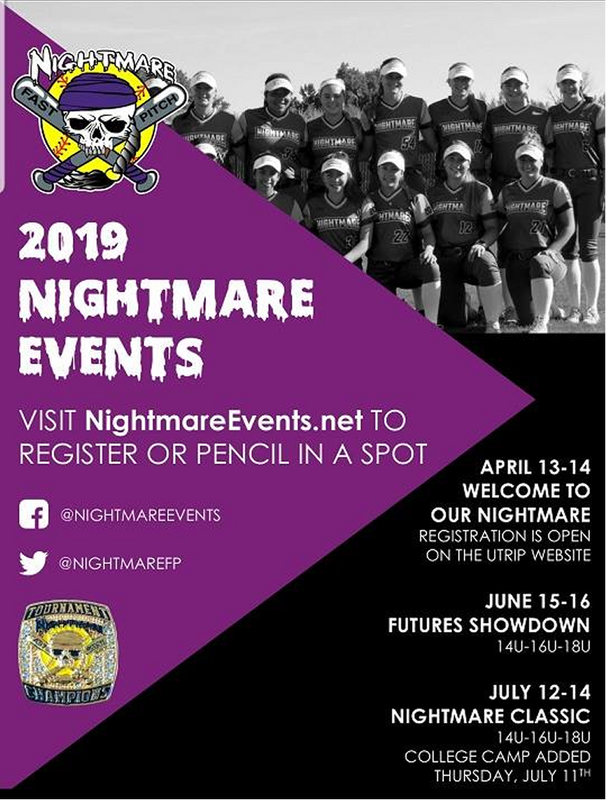 Tryouts (Shared to Social Media) Tournaments & Friendlies (Shared to Social Media) Guest Opportunity (Shared to Social Media) Clinics & Camps NY Tryouts (Shared to Social Media) NY Tournaments (Shared to Social Media) FastPitch Discussion Pitching / Hitting / Fielding Lessons Players looking for Team or Guest Softball Items for Sale or Donate!